Every once in a while an album sails by on the Internet that simply astonishes. In this case it is an album called Another Time. Femme Vanille was completely unknown to me. I can't remember the name ever coming by and now this beautiful album by a Dutch band that deserves an audience. Femme Vanille is singer and composer Karindra Perrier with a band of four. From what I read the band released a singer-songwriter jazz album in 2013 called 'The Coordinates Album'. There's not a lot of jazz to be found on Another Time. 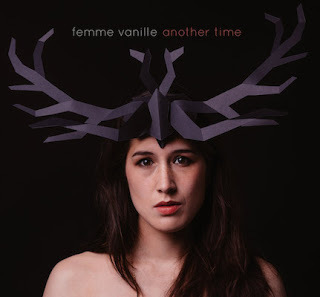 Femme Vanille delves into a form of alternative pop with all sorts of elements that make it prickly, sticky and sometimes even smooth sailing. In other words I need more than two ears to keep up. Femme Vanille challenges its listeners nine songs long to follow in this adventure. The album opens with 'Save Me'. The best opener imaginable. A mysterious guitar part by Jesse Buitenhuis and atmospheric keyboard by Erik Brouwer. On top of this Perrier sings her lyrics that "aim for the stars". Brouwer's piano notes build the steps up. This song is so mysterious. Agnes Obel comes to mind, as nothing is direct here. 'Save Me' at times sounds like a million things are happening at the same time. Over this stylised cacophony the voice of Perrier hovers without ever touching down. When her voice really takes control, in the chorus, all seems to drop away. As if through a hole in the fog a beautiful valley opens below and disappears from sight again when the turmoil returns. What a song to open an album with. There are moments that Femme Vanille catapults me back to the winter of 1978 when I heard Kate Bush on the radio for the first time. In the title song Perrier's voice doesn't go that far out, but the music has that magical element that Kate Bush laid into her music at the time. A fairytale kind of music without a child's perspective in it. At what point in time have fairytales become tales for children? My guess is that in the days that the brothers Grimm wrote them down they were tales adults told each other. Another Time is an album for adults. There's no doubt there. It has nothing to do with the music the children in my environment like to listen to. Femme Vanille plays music that can only be described as serious. Not unlike Sophie Hunger's on 'Supermoon'. In 'Not Too Much Effort' we are taken on a jazzy outing. Driven on by a piano. I have to think of Queen's "Lazing On A Sunday Afternoon'. That was a pastiche, this is the real thing. Vaudeville is transposed into the 21st century and gets a hard edge. Something rough that does not want to be polished. "Who I am, is what I do", indeed. The change to the acoustic guitar in 'We' is almost shocking. Karindra Perrier's voice is rough, far from beautiful. As if she singing the song for 20th time in a row or after a night of heavy partying. In sharp contrast with everything in the background. Although at a closer inspection, the piano could certainly have sounded a lot nicer as well. Some big questions come by in the lyrics leading to the conclusion that "we are a special breed". Yes, we are and one of the results is a pretty song like 'We'. Without that capacity to think, it would never have been here in my room, for me to enjoy. And the further the album is played, the more surprises come forward. Femme Vanille is not caught in one hole. The band has a few sounds and faces. Something that everyone who loves his pop just a little more serious ought to discover. Another Time is diverse, colourful, has rough edges and sticky things but is above all good and beautiful.